The Special Collections Research Center maintains the Washington Writers' Archive. This collection focuses on Washington, D.C. writers and possesses a particular strength in the D.C. poetry community. 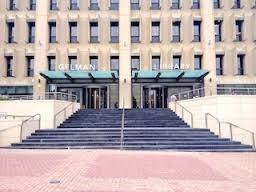 The Washington Writers’ Archive began in 1984 as a partnership between the GW English Department, several local authors and academic institutions, and the Special Collections Research Center (SCRC) at The Estelle and Melvin Gelman Library. The goal of this important academic resource is to collect the literary papers of the writing community in D.C., especially those of artists who focus their work on issues of concern to residents of Washington. The SCRC is actively seeking to collect and make available for research the personal papers of Washington Metropolitan Area writers, as well as the organizational records of publishing houses and other organizations associated with writers. The goal of these efforts is to uncover and explore the ways personal papers of writers and records of local organizations converge to tell a complete story of the community. The SCRC accepts donations of published works of local writers (especially those works published by local small presses) as well as material that communicates the connections between writers in this community. Documents often included in donations include correspondence (especially with other writers and publishers), minutes and other records of writing groups, fliers from public performances, and audio and video of performances. These donated collections will become a part of the community’s collective memory and enrich the available resources used for new discoveries. Special Collections stores archival collections in an environmentally controlled secure storage facility and oversees proper handling and use by researchers. We provide research access to the contents of the records in our reading room and submit collection descriptions to national databases including WorldCat and ArchiveGrid. All these tools inform researchers that GW is the repository holding specific collections or groups of collections that match their research needs. If you have a collection you are considering donating to the SCRC please contact Jennifer King, manuscripts librarian. jenkingATgwu.edu, 202-994-0628. In 2011 members of the DC poetry community, concerned by the loss of history that was occurring with the passing of local poets, worked with staff in the SCRC to create DC Poetry: A Splendid Wake, a wiki that contains biographical articles for more than 500 poets, as well as information on reading series, conferences, and publishing houses in D.C. This living document allows the community to direct the collection of its history by inviting members to share their memories. Through this active partnership with the D.C. poetry community, the GW Libraries celebrate this vibrant and enduring community through an ongoing series of events like “A Splendid Wake.” This annual symposium honors poets of the past and helps to preserve the remarkable literary history of Washington poets from 1900 through the present.